Rates from $695-$995 per week plus tax dependent upon season. The luxury villa rental is furnished and decorated to the highest standards and equipped with all the extras you would expect and MORE in a luxury home, i.e. sun facing screened pool and spa (can be heated)overlooks the lake, oversized deck area (great for sun bathing), air conditioning, TV/DVD/VCR/CD player, leather sofas, fully-equipped kitchen, washer and tumble dryer, master bedroom with en-suite, and further three double-size bedrooms. 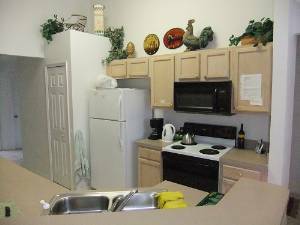 The vacation rental accommodation comprises of a spacious fully fitted kitchen complete with large refrigerator/freezer (with auto ice-maker), dishwasher, microwave, coffee percolator, etc. The living area which has has the true Florida feel. There are two large leather sofas. The entertainment unit has a 46 inch HD Cable TV (over 200 channels),DVD, and CD player. i pod docking station. Free calls to anywhere in USA/Canada. ALL bathrooms have shower, hairdryer, etc. We provide plenty of towels for your use. The large, private, sun facing screened pool has plenty of room for sunbathing to your hearts content and the lighting around the pool area and the underwater lighting ensures that you can enjoy the pool all night long - if you so wish. 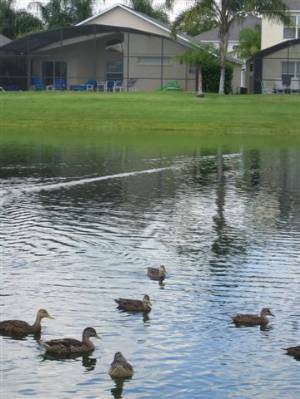 The lakeside is only a few yards away, where a variety of ducks regularly visit. 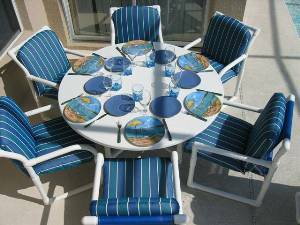 The outdoor dining area comprises of a patio table, six chairs, and two full length loungers, all with with deep-padded cushions. The pool is usually pleasantly warm from April through to October. The heating may be switched on as an optional extra at any time of year. This you can decide before or after you arrive. The villa is fully air-conditioned to keep you cool on hot days and for the occasional cool winter evening there is central heating. We provide the services of a management company that will look after any needs you may have during your stay at our luxury villa - they are on call 24 hours, seven days a week. ONSITE: Tennis, Video Rental, Internet Access, Gym, Fishing, Wildlife Viewing, Swimming, Jogging trail, volleyball court, childrens play park. NEARBY: Amusement Parks (Disney, EPCOT, MGM, Universal Studios, Sea World, Blizzard Beach, Typhoon Lagoon & Many More), Golf, Miniature Golf, Horseback Riding, Shopping, Restaurants. Pool/spa with beautiful Lake view. Outside table and chairs underneath covered lanai. View of villa from the Lake. We visited for 10 days in Aug 2013. We chose this villa based on the reviews we had read, everything written about this villa is true. Location of Lake Berkley is perfect, 15 minutes from Disney, 3 minutes from Walmart. The villa has everything you need, and it is all kept in top class condition. Dad loved the Gas BBQ, I loved sitting out watching the wildlife on the lake, the kids just adored being in the pool. We enjoyed some of the many free facilities of Lake Berkley including the fishing, tennis and 2 Gyms (one inside, one outside). Stephen the owner goes out of his way to make sure you have all the information you need, cheapest car hire, where to buy theme park tickets etc. We give this villa (and service) a well-deserved 5 stars. Let me start off by saying that Stephen was an absolute delight to deal with from the outset, answering questions before we booked, then helping us with car hire and Disney tickets. The check in process couldnâ€™t be easier, Stephen provides a keycode access for the villa, no keys to collect after a long flight. The house was really nice and all 4 bedrooms were a good size. There was a TV in every bedroom and my sons enjoyed the playstation in their bedroom. Kitchen was a great size with all you need to cook family meals. Livingroom was decorated very tastefully and had a nice big TV and dvd player. The location was great, such a nice neighbourhood and close to all amenities. I suggest to anyone who is looking to do this type of rental...Do not hesitate to rent with Stephen. When we were searching for a villa near Disney there were so many options to choose from. However from the very first contact with Stephen the owner we could tell that he cared about his villa and guest. The quote we got was fully explained, there were no hidden extras. This was not the cheapest villa we could have booked, but I am so pleased we spent a bit more to get a modern, clean and excellently located villa. We just returned from 10 days at this villa May 2013.We had a fabulous time at this Lake Berkley Villa. The villa is exactly as shown in the photos and very clean. Overall feel was very "at home" and we enjoyed our stay very much. Location was perfect and very convenient to everything...theme parks and stores, restaurants, etc. But also far away enough so that we can enjoy the peace & quiet. It was our special vacation celebrating 20 years married, and with our 2 children. Everything was perfect and we had a great 'family' vacation. Having lazy breakfast in the morning together on the pool deck patio, hanging out at the pool to cool off, just watching movies together in the livingroom laughing. Kids loved watching TV in their own bedroom, and helping themselves to snacks and drinks from the large fridge. Lake Berkley Resort is gated, secure and very safe. Everything is immaculately kept.... We will definitely love to come back again. Just returned from week over the Jan 2013 new year period. Wonderful house! The house was the most complete vacation home I have ever stayed in - meaning there was nothing I wanted and didn't have; from cooking supplies, furnishings, I pod player, games, books, linens and towels, etc. 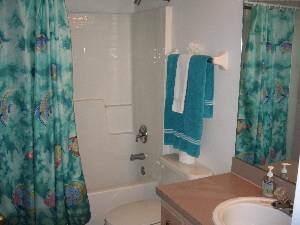 The home was very well maintained and the decor was comfortable and stylish. We paid slightly more ($100 per week) than we have paid for other homes in the past, but it was money very well spent. In life you get what you pay for, and the small extra we paid was well worth the 5 star facilities both at the villa and the resort. The whole family loved the private pool and spa, and the view over the lake was amazing, and at night-time it was fabulous to hear the wildlife across the lake. Most nights we had a BBQ and it was so nice to have the options of gas (convenience)or charcoal (for a better taste). On the day before we left we put all our clothes in the villa washing machine, then the dryer. It was great to think we would not be arriving home with lots of washing to do. The Lake Berkley community the home was located in was very well maintained and the park, lakes, tennis/basketball courts, gym were all in excellent condition. With the 24/7 gated entrance we felt very safe and secure. The location was fantastic with plenty of restaurants, WalMart, and shops close by and very easy to get to the theme parks. Would highly recommend this home and we will book this vill again for our stay later in 2013. That will be the first time we have stayed twice in the same villa, so I guess that says everything. And finally a big thank you to Stephen the owner for all his help with booking and theme park information. 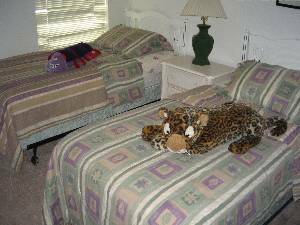 Recently returned from a fantastic family holiday in Florida in Dec 2012 which was made extremely comfortable due to the facilities and location offered with this villa. The central location meant that you could go in either direction to the parks with them all being easily accessible and yet the villa is situated in a very safe and tranquil community., We have three children aged 17, 15, and 7 the age group can make it difficult to ensure that there is something for everyone however with the space and layout of the villa this made it very easy for everyone to find a space for their own quiet time. TVs in every room and the Playstation and I pod player were a big bonus. The kids also enjoyed the free use of the resorts facilities, including the tennis court, basketball court, playpark and fishing in the lake. This is a 24/7 gated community so we always felt the kids were very safe. The villa is of a high standard with the fixtures and fittings and everything is provided, from corkscrew through to free wifi and even a wireless printer (great for printing out maps and shopping info). The pool is the highlight of the villa, with its own spa and wonderful view of the lake. We enjoyed use of both the gas and charcoal BBQs. There are also plenty of restaurants and shops close by with the nearest outlet a mere 10 minutes away (not always good for the wallet!!!) but great fun!!! The information pack provided prior to travel was a great help with the directions to the property clear and precise making the journey after a long flight as easy as possible and with the key code to entry you did not have to go to collect keys or rely on others which was a bonus as our flight was delayed and therefore we did not have to stress about keeping someone waiting. 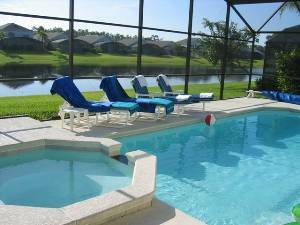 Fabulous villa that we would not hesitate to use again should we visit Orlando again. We stayed here Oct 2012. This villa lived up to all reviews and expectations. We (family of 5) loved staying in this home and hope to come back again. House was very clean and well equipped throughout the whole house. Beds were very comfortable which is needed after a long day at the parks! Pool was perfect for the kids, with easy steps into the shallow end. We loved the spa, especially at night. Great location, close to all parks and major attractions. 24/7 WalMart and lots of restaurants and gift shops were just up the street. 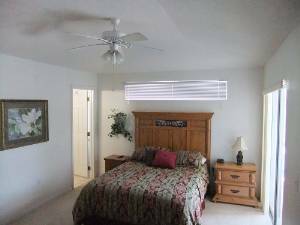 Owner provided directions from airport and other useful information. He answered any questions or emails promptly and was very helpful before we even arrived to the property. Management company was very helpful and provided quick answers to a couple of questions we had. I would definitely recommend this property to anyone planning a family vacation. We had a fabulous time! We stayed for 2 weeks at this villa in Feb 2012. It was absolutely fantastic. We had read the reviews, seen the photos and thought &#8220;can it be that good&#8221;, but every word and photo is true. The Lake Berkley Resort is so well cared for, immaculate grounds and 2 great lakes, I fished in both. At the entrance to the Resort you are always greeted by a friendly guard and immediately you can see that you have arrived in paradise. The villa has a beautiful view of the lake, it is very peaceful, just the sounds of wildlife. Every morning when we had breakfast we had a family of ducks come and visit us !! The villa itself is very spacious and every room is equipped with everything you would need. Indeed my wife actually bought some things she used in the villa which we didn&#8217;t have at home !! I took my laptop and connected to the internet every day, it is very very fast. Watched quite a few Premiership games on Fox Sports on the TV, they show most Prem games . The kids loved the pool, it was a great place to relax and have fun after a hard day at the theme parks. In the evening my wife and I realaxed in the spa with a glass of wine after the kids were in bed. What a way to end a fun filled family day. Memories to last a lifetime. The airport was about 30 minutes away . Another thing we like about the location of this house is that it's off the main tourist strip and totally quiet. We will never stay at a hotel again. Renting houses with your own personal pool is the only way to go. And finally thanks to Stephen the owner for answering all our questions before the trip, and for sending some very useful info, including directions before arriving in Florida. We hope to return in a couple of years and Stephen&#8217;s villa will be our base again. We stayed here June 2012. This villa lived up to all reviews and expectations. We (family of 5) loved staying in this home and hope to come back again. House was very clean and well equipped throughout the whole house. Beds were very comfortable which is needed after a long day at the parks! Stephen, we can't tell you how much we enjoyed staying at your Villa again (Feb 2012). This was our second visit and I know we will keep coming back. (We already have another trip planned with your Villa rented). The home was clean and spacious. With 3 kids it was great to be able to spread out after a long day at the parks. The kitchen had everything we needed to cook meals when we didn't want to eat out and being able to wash clothes made packing easy. As always the kids loved the private pool (the pool heating was perfect), in fact they spent more time this time in the pool than at the theme parks!! The price was way under most decent one room hotels. In a nutshell, the Villa was AWESOME. Thanks again. My family and I just returned home having stayed here for 10 nights in Oct. When we booked the villa we could have booked other villas that were a bit cheaper, howver this one looked the best and seemed in great location. We were not disappointed, the villa had everything, had wonderful lakeview, and was ideally situated to easily get to all the theme parks, with Disney less than 15 minutes drive. We glad we spent the extra money to stay here. I loved the fishing on the lake, played golf on local course just 10 minutes away. Wife loved the spa, and all the reality TV programmes on the TV. Kids loved the pool and having their won twin room with PlayStation. Fantastic holiday. No more than that…our best ever holiday and best place we ever stayed. And thanks to Stephen the owner for all the useful info he sent about car hire, flights etc. He even had a Sat Nav for Florida that we loaned. 5 star villa, 5 star service. We stayed for 2 weeks at this villa in Sept 2011. It was absolutely fantastic. We had read the reviews, seen the photos and thought “can it be that good”, but every word and photo is true. The Lake Berkley Resort is so well cared for, immaculate grounds and 2 great lakes, I fished in both. At the entrance to the Resort you are always greeted by a friendly guard and immediately you can see that you have arrived in paradise. The villa itself is very spacious and every room is equipped with everything you would need. Indeed my wife actually bought some things she used in the villa which we didn’t have at home !! And finally thanks to Stephen the owner for answering all our questions before the trip, and for sending some very useful info, including directions before arriving in Florida. We hope to return in a couple of years and Stephen’s villa will be our base again. Stayed at this villa in Nov 09. We go to Disney every year and normally stay in a hotel, this was our first time in a villa, but it won't be our last. Staying in a villa is far superior to staying in a hotel. You have your own pool, seperate bedrooms for the kids, drinks and snacks kept in the huge fridge, and we saved money by having a BBQ most nights. When we compare the overall cost of the villa compaered to hotel it is much cheaper and far more convenient. As for this villa, well is was awesome. The booking was made easy by Stephen, and we received lots of welcome info before our trip. The villa promised everything was available, and EVERYTHING was available. We have already reserved this villa for our week at Disney next year. Now we are home and the kids look at the photos of the vacation every night, they are already chatting about our week next year. Incredable !!! Stayed at this villa in Aug 09 and we had a fabulous time. The villa is prefectly located for Disney and the other theme parks. Also the villa has a great lake view on lake Berkley, we loved sitting out a night time with BBQ and listening to the wildlife. The kids loved splashing and swimming in the pool, they even prefered the pool to Disney !! The villa has absolutely everything provided. We were very sad to laeve, but we will definitely go back. We have stayed in villas before near Disney, but this was the best we have ever stayed in. The villa has a great lake view, and is in Lake Berkley resort which is a safe and good lacation, close to all the theme parks and shopping/restaurants. The villa is excellently furished with leather sofas, TVs in every room, fully equipped clean kitchen and superb pool/spa. We could not have wanted for anything else in the villa. We have already booked the villa again for our vacation next year. Don't waste your money on a hotel, book this villa (but book soon as we know it gets many repeat bookings). This was our first time in a villa, previously we have booked hotels. We will never stay in a hotel again. This villa had everything and it worked out cheaper than a hotel, and saved us money on drinks and food (we stocked the fridge with drinks and snacks). Also with 3 children it is much better having seperate bedrooms. Our 3 children loved the large private pool, in fact they they had more fun in the pool than at Disney. Most evenings we had a bbq whilst the kids splashed in the pool. The view across the lake in the evening was memorable with the varied sound of wildlife. The villa was spotlessly clean and was well stocked with towels/games/DVDs/books. There is a TV in every bedroom. The booking process with the owners was very easy and they provided directions and lots of useful information prior to our arrival. Access is easy as the villa has a key code system. We hope to return to Orlando in 2 years and will be booking this villa again. We recently stayed here with our family. It was a great villa with all the ammenities we could wish for, clean and well kept. Close to all the disney parks and local places to eat. we would definitely recommend this villa as an ideal base for your orlando holiday. "What a fabulous location, we couldn't believe how close we were to Disney..." DD, Vancouver, Canada. "Everything you told us about the villa and location was true. You made the booking process so easy and the directions were spot on. It is always a pleasure to do business with someone who puts the customer first .Many thanks--we shall be booking again next year. ".EB London. "The villa was perfect in every way....perfect location...everything we needed...we will be recommending to all our friends and family" EB, Yorkshire. 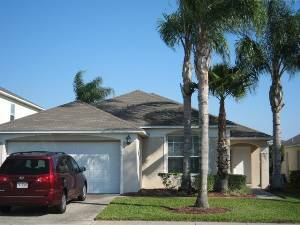 Kissimmee Vacation Rental Villa Rates/Policies: Weekly Rates .. Start from $695/week or £450/week INCLUDING all tax. Discounts Are Available. CREDIT CARD bookings accepted. Last Minute Special Offers Also Available from $89 per night. **AVAILABILITY AND OFFERS SHOWN ON OWNERS WEB SITE** Deposit £100/$150 secures booking. Minimum rental normally 5 nights.